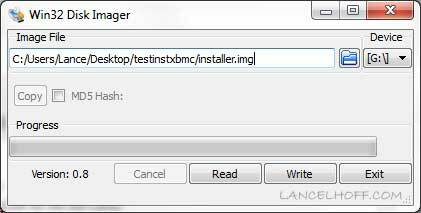 How to Install Raspbmc to USB Manually from Windows: A Windows Raspbmc Installer does exist that enables a user to install and run Raspbmc from a USB drive on their Raspberry Pi. However, if your running a different version of .Net than 3.0 (even a newer version), the RASPBMC installer will crash with an error stating “raspbmc installer has stopped working“. Once Win32 Disk Imager has finished, copy the blank USB file to the SD Card. Plug the SD Card, USB drive, and an Internet adapter into your Raspberry Pi and let it boot up. If all goes well, Raspbmc should begin to boot from the SD card, connect to the server, and then state that it has detected a USB drive connected, and that it is going to install to the USB, unless you remove the USB and power off within 60 seconds.